Laci Peterson's fetus was expelled from her decaying body after her death, a forensic pathologist testified Thursday at Scott Peterson's murder trial. Dr. Brian Peterson, who performed Laci's autopsy, testified there was no evidence Laci had given birth prior to her death. Her uterus had not returned to more of a normal size as is typical after a woman gives birth naturally, said Peterson, who is not a relation of either Laci or Scott Peterson. "That means Ms. Peterson was pregnant and the baby had not been delivered when she died?" asked prosecutor Dave Harris. "That is my opinion," Peterson replied. Peterson said a cause of death could not be determined. However, on cross-examination, Peterson acknowledged he could not determine whether the fetus had been born alive. He estimated its age to be 9 months. Prosecutors claim the fetus was expelled from Laci's decaying corpse, while defense attorneys say the baby was born alive and murdered later, which they say proves their client couldn't be the killer. Autopsy photographs of Laci were displayed to the jurors on a white-wall screen Wednesday, while photos of her fetus were shown Thursday. 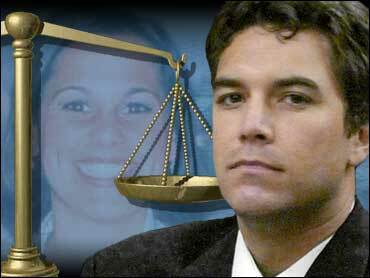 Laci Peterson's family was not in court either day, and has not been in court all week, as testimony led up to the display of the photographs. Scott Peterson looked down while the photos were displayed. His mother, Jackie, used a small notebook to shield her face from the larger-than-life images. His father, Lee, simply looked away. Jurors winced and glanced away as they viewed the photos. At least two were visibly crying Thursday as they looked at images of the fetus' remains. Others squirmed in their seats or covered their mouths. On Wednesday, Peterson said Laci's corpse was missing the head, neck, forearms, and part of her left leg, and her innards were exposed showing a rib cage and other bones speckled with barnacles. Peterson testified that two of Laci's ribs were fractured but he could not say whether the injuries came before or after her death. "The only internal organ that was present was the uterus," Peterson told jurors. "I was limited by the fact there was so much of the body absent." Peterson said Wednesday he examined the remains for any signs that her extremities had been physically cut off, but could find nothing conclusive. "For example, if a joint were taken apart with a knife or a saw, that would often times leave marks on the bone. There were no such marks," Peterson said. He said the tides and currents in San Francisco Bay, or fish eating away at her flesh, could have caused the body to tear apart. He explained in detail how autopsies are performed by cutting open the chest and head and removing the organs. "In this case, there was no brain to examine because the head was missing. There was no heart or lungs to examine because the chest was empty," he said. He said he could tell the woman had been pregnant by the size of her uterus, which had expanded to about 10 inches. It normally is the size of a golf ball, he said. Peterson said the top of the uterus was open and there were no signs of a Caesarean section. "I determined the baby had exited through the top of the uterus," he said. Prosecutors are trying to prove that Peterson killed his eight-months pregnant wife on or around Dec. 24, 2002, then dumped her weighted body into the bay. The remains of Laci Peterson and her fetus washed up in April 2003 not far from the Berkeley Marina, where Scott Peterson says he launched his boat that Christmas Eve morning for a solo fishing trip. Defense lawyers maintain that someone else abducted and killed Laci as she walked the couple's dog around the neighborhood after Peterson had left for his fishing trip. Earlier, prosecutors used an expert to attempt to show Peterson lied about a crucial element in the case when he told police he used cement mix to repair his driveway. Prosecutors claim Peterson used the cement to make five anchors, one of which was found in his boat. The others, which they allege he used to sink his wife's body in the bay, have not been discovered. Peterson told police he made only one anchor and used the remainder of a 90-pound bag of cement to repair his driveway. Jurors have also heard Peterson tell the same story to his dead wife's brother, Brent Rocha, on a wiretapped telephone call. However, a prosecution witness testified the concrete samples taken by police from Peterson's driveway did not match the concrete in the anchor discovered on the boat. Robert O'Neill, president of Micro-Chem Laboratories, which analyzed the concrete, said the material from the driveway was inconsistent with the material in the anchor. "This is a different mix," O'Neill told jurors. On cross-examination, defense lawyer Mark Geragos vigorously attacked O'Neill's findings, noting that the only difference in the two concrete mixtures is that the sample taken from the driveway contains large gravel-like chunks. All other components in both mixtures are identical, Geragos noted. O'Neill acknowledged Geragos' assessment was correct but insisted the two concrete samples were from different mixes. Geragos said Peterson simply poured the cement mix onto the driveway where the larger rocks already were and that's when the two mixed together. "The larger rocks were obviously mixed in with the material," O'Neill said, in defending his position. It's a key part of the prosecution case and could be powerful if it proves that Peterson lied about where the remainder of the cement mix was used, legal experts said. "This lie is different than a lot of the other lies. This lie goes right to evidence in the case ... and goes right to consciousness of guilt," said Robert Talbot, a professor at the University of San Francisco School of Law, who has been observing the trial. "Now, he's lying about crucial evidence which is the prosecution's theory of how the body was weighted down."